You are here: Home / Articles / Video Library / Recent News Videos / Who is Responsible for Southwest Engine Explosion? With commercial airline travel in the US generally safe, what caused the Southwest airplane accident and engine explosion that left one woman dead and many others injured? How can we be sure this type of plane accident does not happen again? Aviation litigator and Florida attorney Mike Eidson adds his commentary on this issue. If you’ve got a flight scheduled on Southwest Airlines over the next 30 days, be prepared for delays or cancellations. In the aftermath of last week’s deadly accident in Pennsylvania, the airline has announced that it’s going to be inspecting their planes that use the same engine that was in the accident. The explosion on flight 1380 was caused by a fan blade that broke off. It shattered a window and killed one passenger. The first U.S. passenger airline fatality since 2009. Needless to say that everyone on the plane was traumatized by the accident, and has a claim to recover their damages from those responsible. 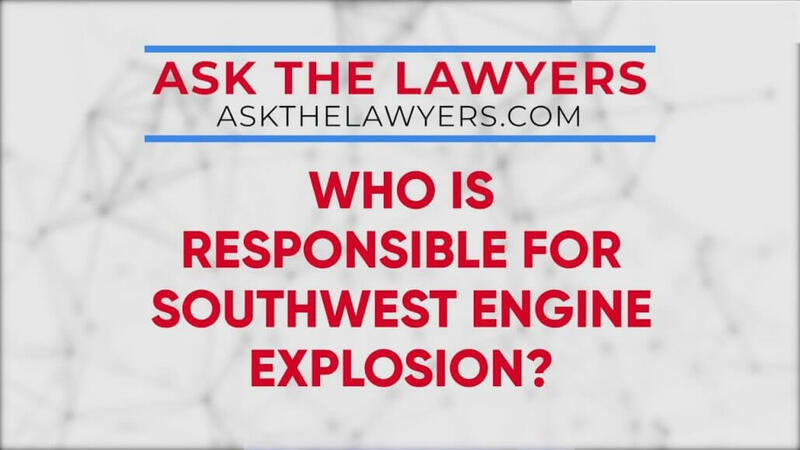 For more information about aviation litigation, call (888) 544-6767.
https://cdn.askthelawyers.com/wp-content/uploads/2018/05/28085235/who-is-responsible-for-southwest.jpg 720 1280 AskTheLawyers™ https://www.askthelawyers.com/wp-content/uploads/2018/05/Asset-2-300x40.png AskTheLawyers™2018-05-15 09:17:552019-04-25 07:54:08Who is Responsible for Southwest Engine Explosion?